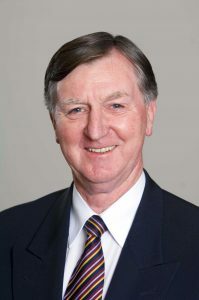 AT a recent meeting of the Bridgewater PCYC, Max O’Neill was presented with a life membership award. 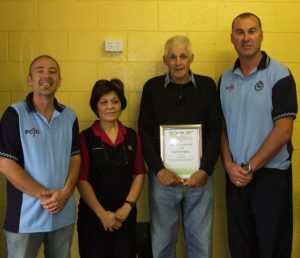 Bridgewater PCYC’s Andrew Dean said Max had been a valued volunteer and supporter of the club for the past 18 years. From left, president Rodney Graham, Rosie O’Neill, Max O’Neill, and club superintendent Byron Howard. ATHLETICS Tasmania is once again organising some major cross country events at the Pontville Equestrian and Sporting Complex, with more than 1000 runners set to take on the challenging course, over three days of competition. DURING the first week of the school holidays, the Bridgewater PCYC along with the Clarence PCYC teamed up with players from the Clarence and Glenorchy Football Clubs as well as a few Tassie Mariners to hold a footy clinic at Bellerive Oval. It was a fantastic day where more than 150 kids attended and learned some important skills and knowledge of the game by some up coming talent the state has to offer. The Bridgewater PCYC took two buses of local kids to attend the clinic. 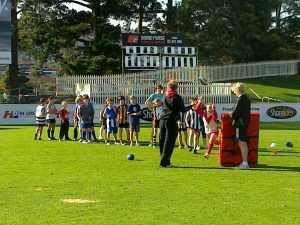 Some of the children learn footy skills at Bellerive Oval during the school holidays. IT’S not often that a not-for-profit community group becomes a centenarian but that is exactly what the Girl Guides Association has accomplished in 2010. 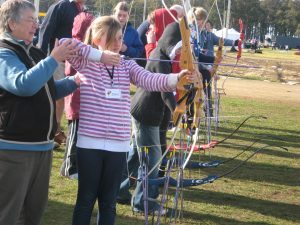 Shanae Splann, 10, from the Brighton Sunflowers Girl Guide Unit tries her hand at archery. BRIGHTON ratepayers are continuing to enjoy the benefits of the municipality’s revolutionary flat-rating system with a minimal rate increase set for next financial year. BRIGHTON Council is establishing a special advisory committee to coordinate input on community issues affecting Bridgewater and Gagebrook. THE decision by the Tasmanian Government to release a management plan for the important Aboriginal heritage areas near the new Brighton Bypass is fantastic news for our municipality (see story on the Home Page). Farm fete an essential cash cow! 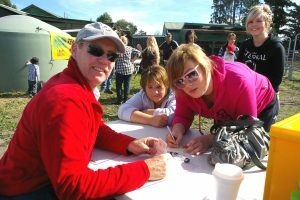 BRIDGEWATER High School held its annual fete at the school’s Brighton farm earlier this year. Bridgewater High maths teacher David Tongs accepts Guess the Weight of the bull competition entries from former students Amy Cross, right, and Eliza Bedford. Author ingridhPosted on June 17, 2010 Categories HomeLeave a comment on Farm fete an essential cash cow! BRIGHTON Council has welcomed the Tasmanian Government’s announcement of a management plan to protect the Aboriginal heritage values in and around the proposed Brighton bypass.